Good news for VirtueMart store owners! We are constantly working on improvement of Store Manager software and addons are not the exception. 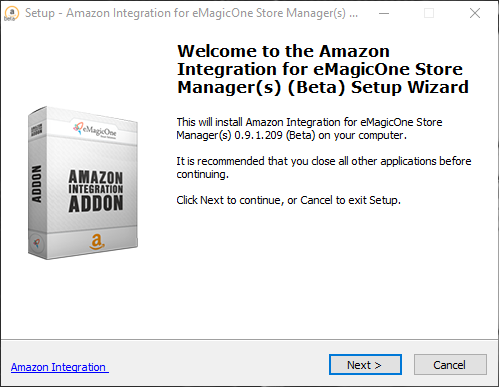 eMagicOne team is happy to announce the renewed BETA version of Amazon Integration that has just been developed. Integrate your VirtueMart-based store with one of the world’s biggest marketplaces: export products synchronize existing ones from your online store to Amazon, process orders to expand your business and increase the circle of potential clients. You can download renewed Beta Amazon Integration version of the addon following this link - Download VirtueMart Amazon Integration addon. 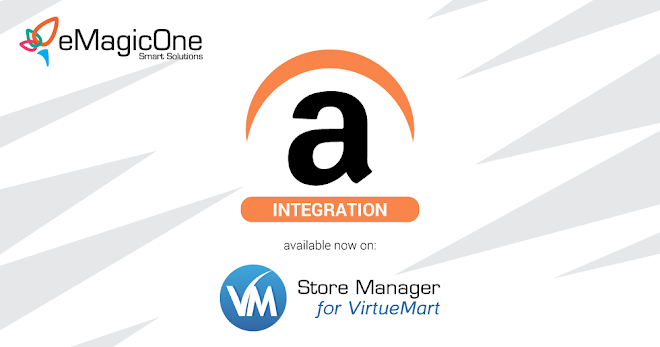 Current Amazon Integration Beta version is compatible with Store Manager starting from version 1.11.0.879. 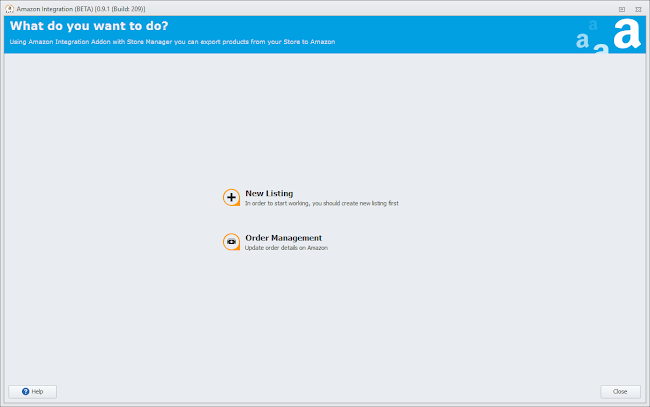 If you are using older version of Store Manager, than it is specified and want to update Amazon addon to the version 0.9.1.209, you have to update the application first. Product listings have been added in current version of Amazon Integration. The log list of recently performed operations is now available in this version of the addon. The possibility to schedule and execute task has been implemented. Now, the parameters of the window are saved after closing the Amazon addon. Correspondingly, the same size of the form is uploaded and used after next opening of the Integration. The list of suggested categories is now available to use at the step of mapping categories. The Amazon category search has been improved with quick search filter. The possibility to save and load the listing settings has been added. 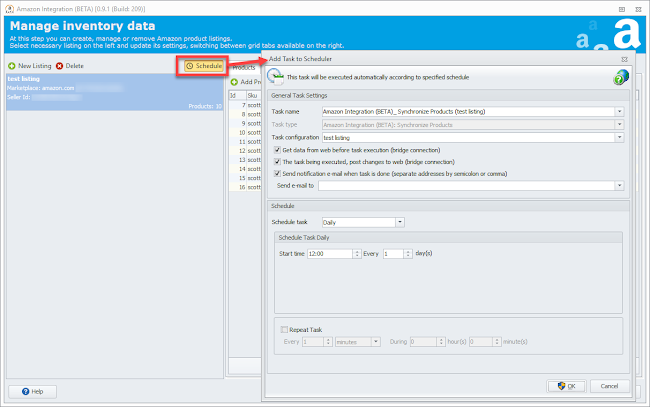 The placement of Integration elements has been changed. The interface of the addon has been enhanced as well. 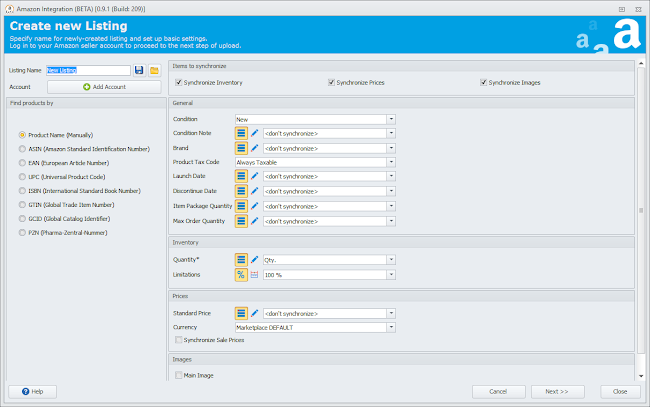 The ability to choose the field to export product quantity from has been added in new BETA version of Amazon Integration addon. 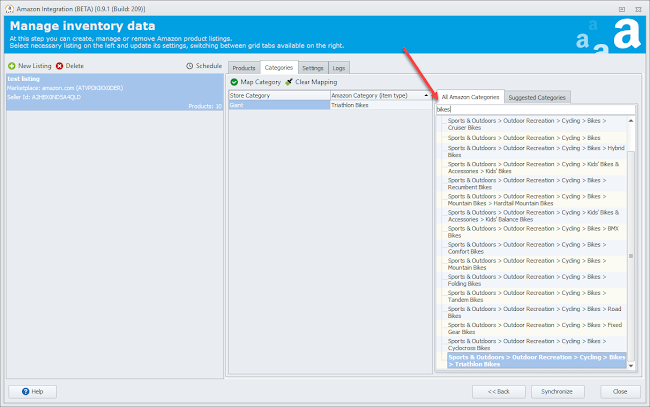 Export quantity of products according to specific rules is available in this version of addon. Download Amazon Integration installation .exe file on your PC. 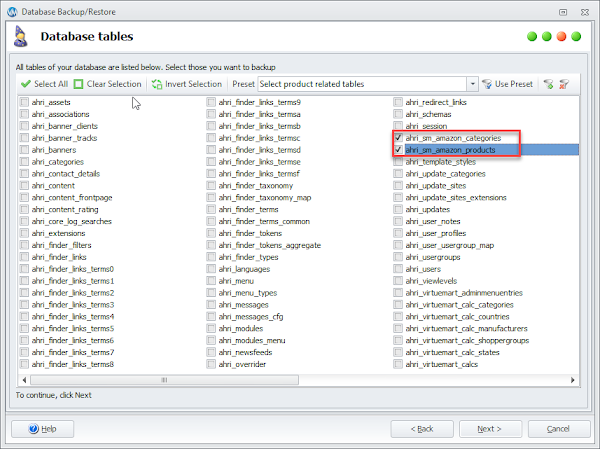 Proceed with installation steps with a special setup wizard. It is recommended to close Store Manager before you continue with further steps. Read and accept Licence Agreement. 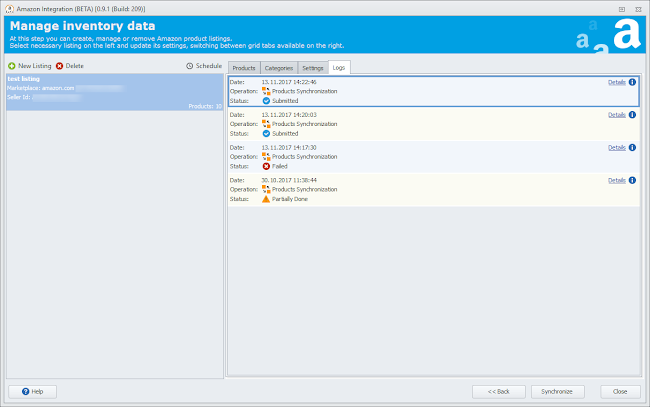 Select Store Manager the Integration should be installed on (Store Manager for VirtueMart in your case). How to return back the old version? 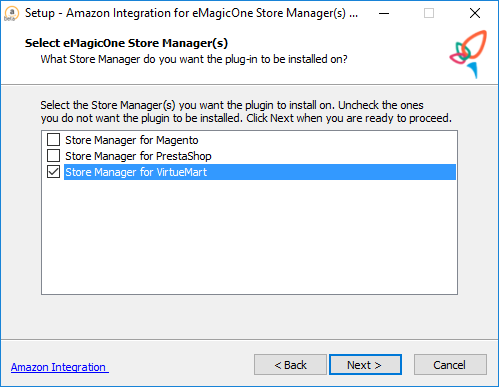 Close Store Manager and copy the previously saved old AmazonIntegration.dll file you have been using to C:\%ProgramFiles%\eMagicOne\Store Manager for VirtueMart\Plugins\. 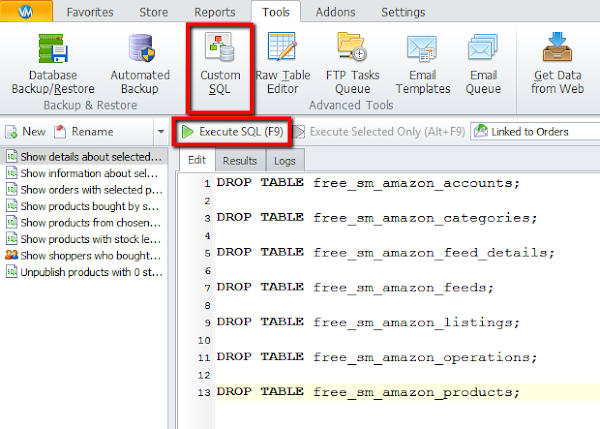 Proceed the same way with AmazonIntegration folder to c:\Users\%username%\appData\Local\eMagicOne Store Manager for VirtueMart\ and amazon_integration folder to c:\Users\%username%\appData\Local\eMagicOne Store Manager for VirtueMart\LocalMySQLData\data\. 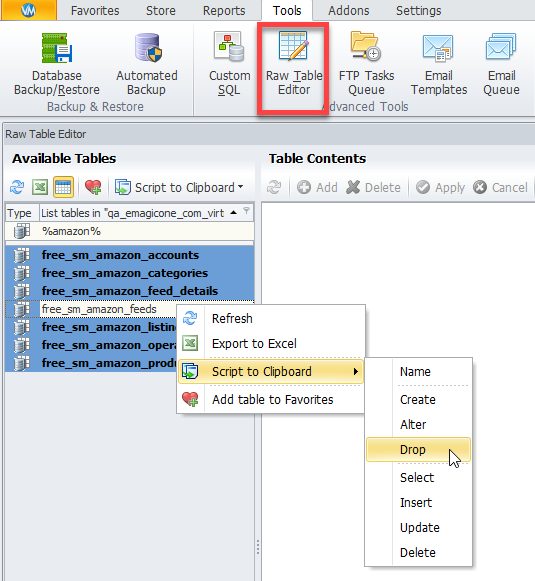 Restore tables related to Amazon, previously saved in .sql file.